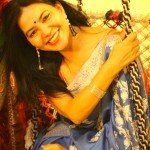 # 29 Most of my front rows and hanger saree are gotten used by now. I choose to pulled out from the back shelf and different sanduk (metal suitcase) where I usually keep those sarees which I don’t wear regularly or those heavy sarees which are used only in wedding season. I peeped inside the trunk carefully. there is yellow fabric deep inside and got pulled out little while I was removing my other sarees. 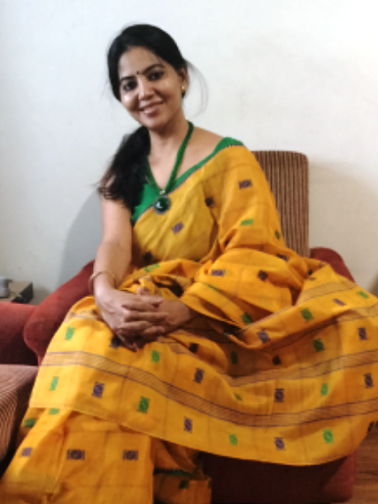 I carefully removed the sarees from top so that I could see this yellow one. I took her out and felt as if she was very happy to be in my hands. She slipped down the floor in a dancing move. I kept her inside the bag with her other friends and she was happy to go for a joyride. She is a cotton saree with weaving in the squares. It came as a gift in my wedding and wore it only once then. I have matached a simple green blouse and a matching necklace of minute glass beads.